We left Sioux Falls on January 14th,1961 and drove to St.Johns, New Brunswick Canada to rehearse and start a 3 month Trans Canadian tour with Buddy Knox. We were told by the Promoter George Nellis from Moosejaw that it had never been done by an American band. Since Buddy was no longer using The Rhythm Orchids as his band The billing now read Buddy Knox with Myron Lee and the Caddies. I had met Buddy the previous year when we played some dates with him in the midwest. We hit it off right away and even though we were a bunch of green young kids just out of high school he liked the way we sounded and how we were received by the crowds we played for. Buddy was from Happy, Texas and drove a brand new Cadillac Coupe Deville. He had a thick head of hair and talked with that Texas accent. He had a rack full of custom made suits and shirts hanging in the back of his Caddy and his very presence radiated “ROCK STAR”. I had watched him on a lot of TV shows including Ed Sullivan and I had bought all of his hit records. All of a sudden here I am working for him. As they say, I was walkin’ in tall cotton and I was livin’ the dream at 19 years old. One of our first dates was on Prince Edward Island. We drove our cars on an ice cutter that took us across a bay to get there. We could see seals floating on pieces of ice coming down from Greenland. In the larger cities our promoter would add acts to join us and the crowds were large, some being 10,000 or even larger. 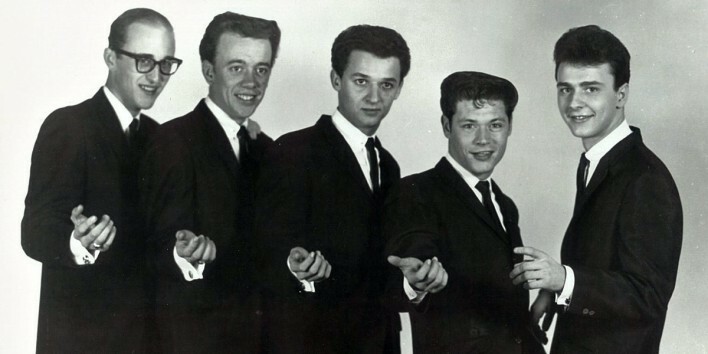 In Toronto and Montreal Dion and The Belmonts,The Ventures, and Bobby Vee were added. Bobby and his brother Bill had driven all the way from L.A. in Bobby’s new VW car. I was especially happy to see them because we had met a few times in the midwest and were friends. We worked our way across Canada playing six nights a week with all Sundays off. We didn’t have any problems with snowstorms thank God, but when we got to Manitoba in late February the night time temps were falling to -50 below at times and there wasn’t a wind chill factor in those days. When possible we would rent a stall in a gas station over night to get our cars and trailer inside. For every tank of gas we added a can of heat to keep ice out of the gas line. When we played Flin Flon, Manitoba, the last 100 miles or so we drove on a gravel road. Our dates were often three or four hundred miles apart and a lot of our driving was at night. Buddy’s wife Glenda was at home in Georgia, so many times Buddy would ask me to ride with him to help drive and keep him awake. I was more than thrilled to do that (of course) and a lot of hours were spent listening to Buddy’s experiences in the music business. He talked about Buddy Holly a lot and told me about all the people he had worked with including Elvis and the big shows in New York with Alan Freed. He told me that when 14 year old Paul Anka came from Canada to join them in New york for a show, Paul was short of money so Buddy let him sleep in his bath tub at night to save on money. Buddy was paid in cash and when we would check out of a hotel Buddy had this black briefcase full of money he would toss in the trunk of his Caddy. It always had $20-30,000 dollars in it and often we would stop at a bank so he could wire money home to Glenda. I had never seen anything like that growing up in South Dakota. In Edmonton, Alberta Johnny Tillotson and The Coasters joined us for some shows. On our last date in Vancouver, B.C. we were added to the Johnny Cash Show on April 16th. It was spring and we headed back home to South Dakota. The band and I did a lot of growing up on that 3 month tour. I know I did for sure. When I left Sioux Falls in January my hair style was the greasy look with the part on the left side using Brill Cream (a little dab will do ya). Now in April I had the new dry look with hair brushed back using a hair dryer to fluff it up, followed up with hair spray just like Buddy, Bobby and Dion. We also bought mohair custom suits made just for us like those guys wore. Years ago a newspaper man from Canada sent me a story he wrote about that historical tour in 1961. He called my band “THE FOOT SOLDIERS OF ROCK AND ROLL”. Just check’in in. My sister Susan Olson (now Clark) was Curt Powell’s wife. His daughter Lorenda (my niece) is trying to find more about her father.